I’m no mechanic, but I knew it didn’t sound good. As Billy, our captain, fiddled with the grinding transmission below deck, our five-person research crew exchanged guarded pleasantries about how nice it was to be out on the water. Way out. This was our first day of right whale surveys in the Great South Channel east of Cape Cod, and we were roughly 32 miles from shore. Surrounded by several mother-calf pairs, everything seemed to be going quite well—until the boat got stuck in reverse. After one valiant attempt to photograph a whale as we passed by backwards, our fate became painfully clear: we were going nowhere fast. Billy reluctantly radioed a fellow fisherman for a tow, and nine hours (and several snapped tow lines) later, we arrived back at the dock in Harwichport. I must confess my lack of enthusiasm when I heard our fearless leader, right whale scientist Moira Brown, talking to our tow boat captain about another excursion for the following morning. War stories aside, I did relish this opportunity to study North Atlantic right whales again. Having assisted in seasonal survey efforts in both the Bay of Fundy and the southeastern U.S. in the early 1990s, it had been more than a decade since I last worked with the New England Aquarium’s team of right whale researchers. A landlubber at heart, I’ve focused my passion for wildlife conservation on New England’s forests rather than its rugged seas. But when I was invited to join the crew for a two-month stint in Massachusetts last spring, I jumped at the chance. The months prior to our survey were a rollercoaster ride for the North Atlantic right whale, whose highly endangered population is estimated at only 300-350 animals. A total of 28 calves were born in the warm coastal waters of Georgia and northeast Florida in winter 2004/05, marking the second largest calving season ever documented. But this promising news was tempered by the tragedy of eight right whale deaths over the previous 16 months—including six adult females, three of which were carrying near-term fetuses. At least half of these deaths resulted from ship collisions, and one from entanglement in fishing gear. The last carcass washed up on Cape Cod’s South Monomoy Island only days before my arrival to the field station. Humans have been pivotal players in the plight of the North Atlantic right whale since whalers were first introduced as a predator a millennium ago. For early Basque whalers, this species was the ideal prey (the “right” whale to hunt), given its proximity to the coast, its trait of floating upon death, and its abundant yield of baleen and oil. North Atlantic “stocks” were severely depleted by European and American colonial whalers, and the population was first thought to be extinct by the mid-1700s. 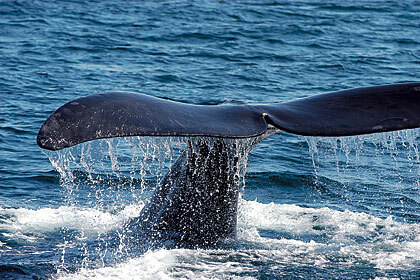 Partial respite came for the right whale in 1935, with the International Agreement for the Regulation of Whaling. Yet, despite 70 years of formal protection, the species shows no sign of recovery. Morning on the water: our crew huddled together in the wheelhouse to stay warm during the several-hour trip to the whale feeding grounds. This was not a trivial task, as the sea had yet to soak in much sunshine and the icy wind cut to the bone. I topped off my myriad layers of clothing with a seemingly impenetrable “float coat,” designed to keep my head above water if I decide to take an inopportune swim. Using photography as our primary research tool, our mission was to document animals migrating through on their journey north. Indeed, some of the whales visiting the Great South Channel are rarely recorded anywhere else. Gathering information about these whales—especially cows and calves—is crucial to better understanding the demographics and habitat needs of the population as a whole. Conveniently, right whales have distinct patterns of hardened skin on their heads called callosities. Like magnified fingerprints, these callosities hold the key to right whale photo-identification, which in turn provides a basis for monitoring the population. As research photographers, our goal was to capture both sides of the whale’s head, plus other body parts and scars for good measure. Generally, a single whale is a relatively easy target, but a mom with a calf ups the ante—they’re important to document, but they can also be quite elusive. One afternoon, as we prepared to call it a day, we came across approximately a dozen aggregated whales. This was a vigorous “surface active group,” a social gathering thought to be associated with courtship. The focal female, who probably weighed 60 tons or more, rolled her massive bulk around in the water, occasionally displaying her brilliant white underbelly to the sky. Meanwhile, various suitors joined the teeming whale soup, sometimes approaching from miles away. The scene was so powerful that at one point I had to put down my camera just to watch. I couldn’t let science stand between me and that moment. Of course, there were many other moments that challenged my romantic notions of being a marine biologist. Soon after leaving Harwichport one morning, the ocean seemed “confused.” As the ambivalent chop relentlessly heaved my stomach in opposite directions, I began to feel that horrifying sense of imminent seasickness. Panicked, I tried to convince myself that it would pass. But within minutes, I realized that if I as much as turned my head, it was all over. My good friend Amy Knowlton—a senior scientist who has survived many a nasty day on the ocean—handed me a pretzel rod. For the next three hours, that pretzel became my tether to hope, and I held on for dear life. The worst of it passed just in time to photograph our first group of whales. While I feel fortunate to have played some small role in building our knowledge of right whales, I’m also more aware than ever of their vulnerability. Our cultural commitment to “business as usual” has created a deadly obstacle course for a species desperately striving to navigate its way to the future. Thanks to the work of the aquarium and a handful of other organizations, some conservation measures (albeit modest) have been taken. But much more needs to be done. Without regulations to slow ships down and route them around places where whales are known to congregate, the right whale’s prognosis seems grim. Still, I hold on to one image, the highlight of my experience in the Great South Channel, when we sighted a giant matriarch named “Admiral,” believed to be one of the largest and oldest right whales in the North Atlantic population. Admiral moves through the sea with a grace and dignity all her own, carrying with her the tales of survival that too few of her kind possess. I hope with all my heart that, a century from now, her magnificent ancestors still find home in a place that we’ve since learned to share. Paula MacKay ’86 spends most of her days on land, working in wildlife research and conservation. She is currently co-editing a book on carnivore survey techniques, and lives with her husband in Starksboro, Vermont. Originally published in the Summer 2006 issue.